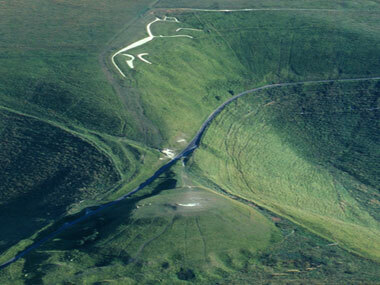 A famous legend tells about St George who defeated the dragon on Dragon Hill, near Uffington, England. Many believe that he killed the dragon, but that is absolutely not the case. He merely tamed the dragon. He became master over the dragon – Dragon Master. He became master over his own inner dragon. Master over his own future, his destiny. To become ‘Master over your Dragons’ is one of the main goals of our Dragon Path Expeditions to England. It is May 20, 2012. Heather and I are enjoying a well deserved rest after a very exciting week. One day earlier our 2012 Dragon Path Expedition had come to an end. My mind rushes back to 2011 when we organised our first Dragon Path Expedition, named after the Michael Alignment, which is also called the Dragon Path. We arranged this tour so that others could also experience the magical and mystical powers in and around the Wiltshire landscape, without the craziness of crop circle chasing. Although this was our non-crop circle tour, the 2011 Dragon Path Expedition participants secretly hoped that one or more crop circles would appear and that they would be able to visit them. Every day I told them: ‘No! This is a non-crop circle tour’. They were so persistent about going into a crop circle that one night during dinner Heather and I finally agreed that if a crop circle was formed during the remaining days of the tour, we would take the group into it, but only if and when several conditions were met. Our conditions made me smile. Even on “good” circle-chasing days, these conditions are rarely all met. 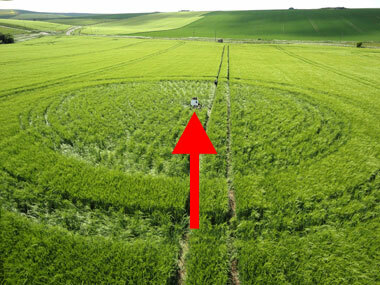 I was sure we had excluded visiting a crop circle during our 2011 Expedition. The last day of our 2011 Dragon Path Expedition (DPE) had arrived, and we are about to visit the ancient wisdom keepers - the Dragon Masters - at West Kennet Long Barrow . As we were walking up to the impressive Long Barrow, the group was sharing how they were a little bit bummed that there had not been a crop circle for them during this tour. As I was listening to their discussion, I looked over towards East Kennet Long Barrow and saw that there was a shadow in the field. My breathing stopped and my heart started racing. After years of circle hunting I recognise a crop circle from miles away. I quickly scanned the land. There was plenty of parking space next to the field. No need to cross a road and we had plenty of time left to visit the circle. But what about the farmer. One of the conditions we had stipulated was that the farmer would welcome us on his land. Right at that moment my eye was drawn to a white object in the middle of the crop circle. I grabbed my binoculars and got confirmed what I deep down already knew. The white object was a sign attached to an honesty box (place to put money in which goes toward compensating the farmer for any crop damage). 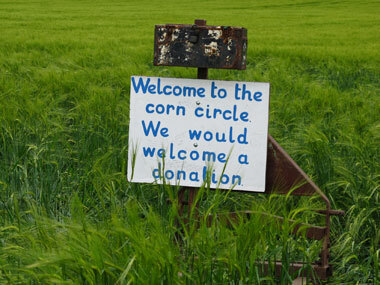 The sign read: ‘Welcome to the corn circle. We would welcome a donation’. I looked at the circle, then looked at the group, and I swear I heard them thinking, ’This is how you do it Bert. This is what happens when you tame your inner dragon.’ During the past week, there had been NO new crop circles. Now, on the final day, a couple of hours before their closing dinner, their collective dream was coming true. They did it. The DPE participants had manifested a formation in the final hours of their tour! That was 2011. I focus shift to 19 May 2012. The day our second Dragon Path Expedition ended. An Expedition that turned out to exceed our wildest expectations. Every day was magical and powerful for us and the participants. Every day each member of the group was opening up to their own inner wisdom - their inner dragon power. 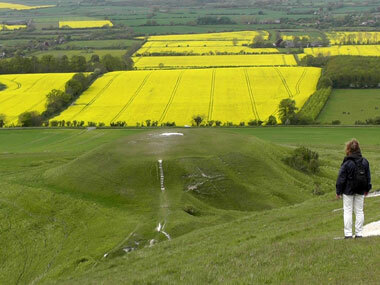 Especially the day we went to the Uffington complex on Thursday 17 May, 2012, was saturated with Ah-Ha experiences. The Dragons at Dragon Hill were helping each participant to heighten their awareness during the tracking exercise on top of the hill. As the group was leaving, several participants were looking around at and taking pictures of the fields that you can see from the top of Dragon Hill. 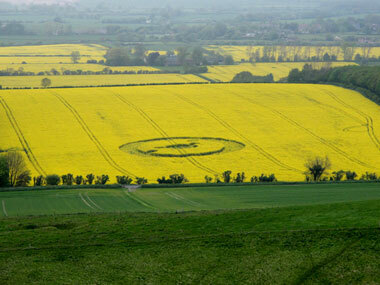 I could feel the longing in them to go into a crop circle like last year’s DPE group did at West Kennet Long Barrow. I lingered on top of the Dragon for a few more minutes looking around and absorbing the landscape. When I came down the hill, Heather said with a twinkle in her eye as if she could read my mind, “Dragon Taming Bert, not Circle Chasing.” I smiled. Two more days of the Dragon Path Expedition to go. Two days later, Saturday 19 May 2012, and the final day of our expedition. 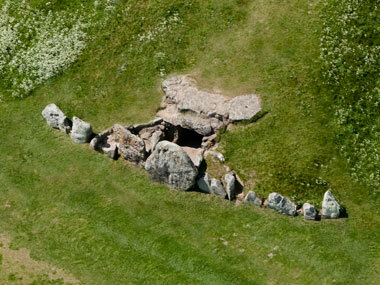 We are on our way to visit the ancient wisdom keepers - the Dragon Masters - at the West Kennet Long Barrow. No crop circle had appeared so far. And just like on the 2011 expedition, again I could sense a feeling of disappointment rippling through the group. We finished at the long barrow and went to the Adam and Eve stones. From there we continued onto Devizes to spend some group circle time in one of our favourite pubs. Because the Dragon Path Expedition is designed to facilitate the opening to one’s inner knowing, group processing time is a key component of the tour. As early evening approached and the locals began to file in for their nightly food and drinks, we packed up to head to a restaurant in Chiseldon where our closing dinner would be at. Every one decided to go their own way to the dinner restaurant. We pull out of the pub parking lot first, and lose sight of the other cars. About 10 to 15 minutes away from the pub in Devizes, I get a call informing me that there is a posting on Face Book of a new crop circle at a white horse hill. White horse hill? That could be several different places in England! The good news is that the caller had also obtained the coordinates. Heather pulls out the TomTom car navigator, and enters the coordinates. We are patiently waiting for TomTom to calculate which white horse hill in England these coordinates are connected to, and then the shock happens. 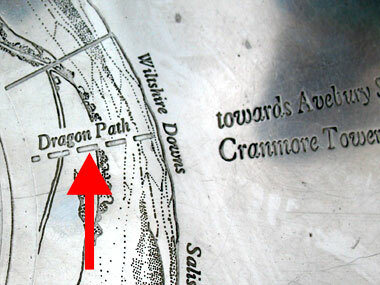 The coordinates are at the foot of Dragon Hill at Uffington. I pull over to figure out what to do with this information. Tell the group? Not tell the group? How would we get a hold of all of our group members before dinner to let them know about the new circle? Would the restaurant let us change our reservation time? As Heather and I are discussing all of these options, our assistant, Piet, pulls in behind us and then to our total surprise, the rest of our group pulls in behind him. How did this happen? Everyone was going their own way when we left the pub in Devizes. The message is clear. Dragon Hill is calling. Again, just like the 2011 expedition, the 2012 expedition participants are visiting a new crop circle in the final hours of their tour. 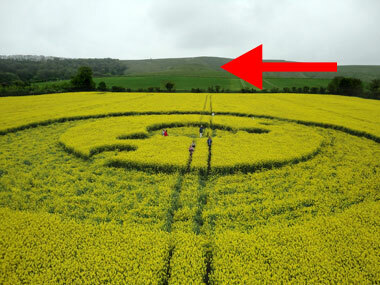 What are the odds that during our 2012 Dragon Path Expedition, that this new crop circle on 19 May 2012 is at Dragon Hill? 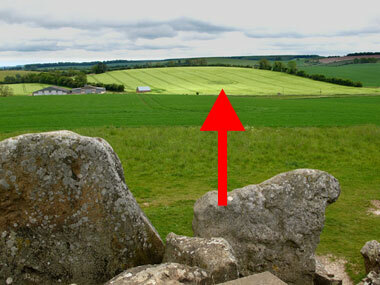 Considering all of the available fields around Wiltshire, what is the probability that this new circle would be at the home of the Dragons? Are the circles reflecting back to us our level of awakeness? Our level of consciousness? Did the Dragon’s hear the collective intention of our 2012 DPE group? 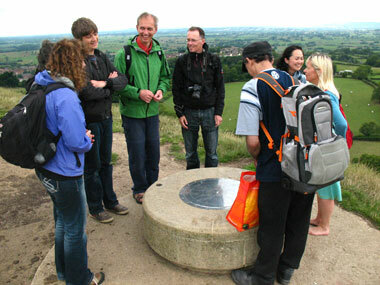 During the month of May for two years in a row, 2011 and 2012, I have taken people on a non crop circle tour in England. Wanting and hoping that the magical and mystical aspects of England, even without crop circles, would awaken the quest within each participant. The ancients called it the quest of ‘know thyself’. In modern days, it has been linked to King Arthur and the grail quest. For me, it is the quest that I see described in so many of the stained glass windows in the churches and cathedrals in England. It is St. George taming the Dragon, becoming a Dragon master. Master over his own destiny, and that is exactly what I hope each tour participant achieves. Were the 2012 Dragon Path Expedition participants being guided by their own mastery, and was the crop circle at the base of Dragon Hill a culmination of, a reflection of, each participant awakening their inner gnosis? If one group following the Dragon path can have this level of communication with nature, then imagine what great things humanity is capable of. Travel together with us to England in 2014.